Hi mga Ka-TM! Avail the TM All-Day Facebook Promo and enjoy the unlimited Like, sharing, browsing, chatting and updating your status on your Facebook. Promo runs until August 31, 2014. To avail the promo, load up your regular TM Prepaid promo. You must have enrolled first in any TM promo (see list below). 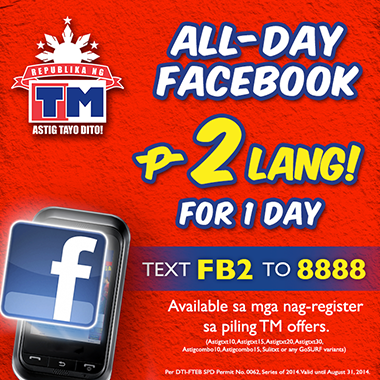 Register to TM’s All-Day Facebook by sending FB2 to 8888. Wait for the confirmation message or you text FB2 STATUS to 8888. Once registered success, you can now enjoy unlimited Facebook surfing for 1 day. How to Register to TM All-Day Facebook FB2? Per DTI-FTEB SPD Permit. No. 0062, Series of 2014. Visit Republika ng TM Facebook page for more details and latest updates.